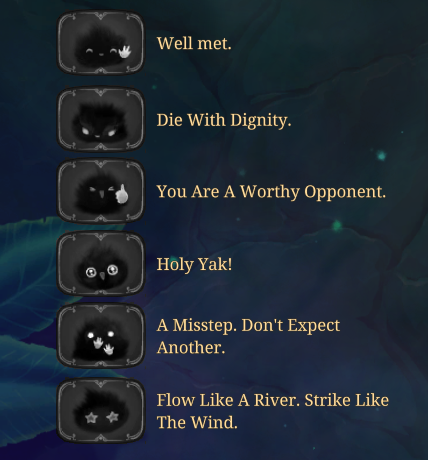 A brief list of all the unique emotes in the game. Well met! Have you ever wanted to compare all the emotes in order to decide what set you like the best? Maybe you're just looking for extra snippets of lore? Either way, you have come to the right place! Well Played- "You Are A Worthy Opponent"
Oops- "A Misstep. Don't Expect Another." Unique- "Flow Like A River. Strike Like The Wind." 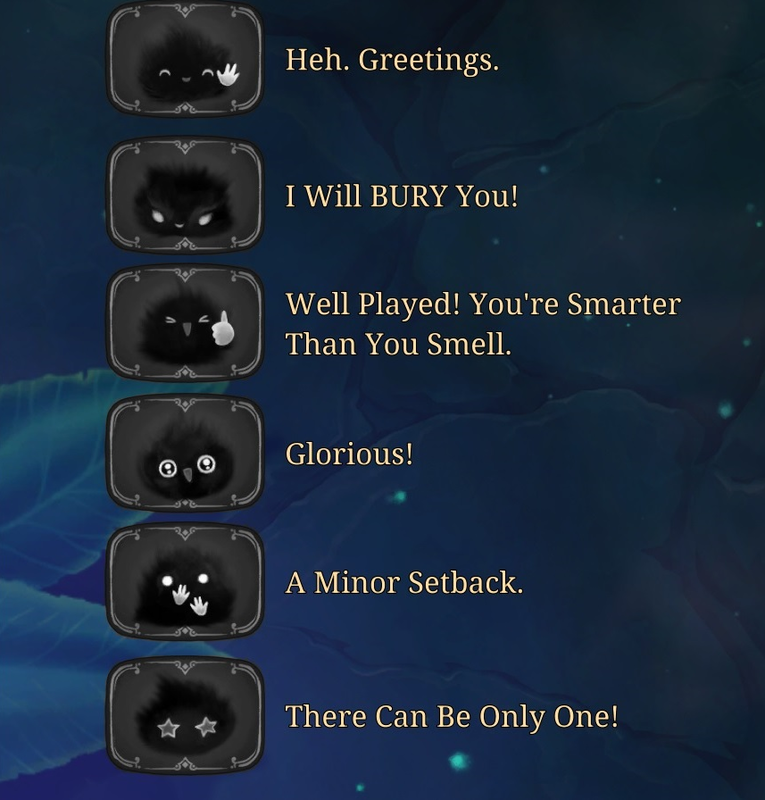 Well Played- "You are a fine hunter"
Wow- "By my fearsome fangs!" Unique- "What 'kills' me only makes me stronger." Greetings- "May the best frog win." Taunt- "Maybe you should buy more cards." 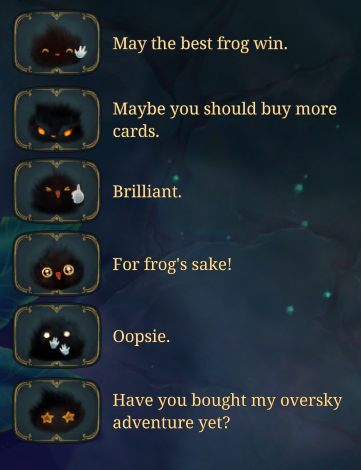 Unique- "Have you bought my oversky adventure yet?" Well Played- "Well played. I underestimated you." Unique- "Everything is part of my plan." Greetings- "The earth greets you." 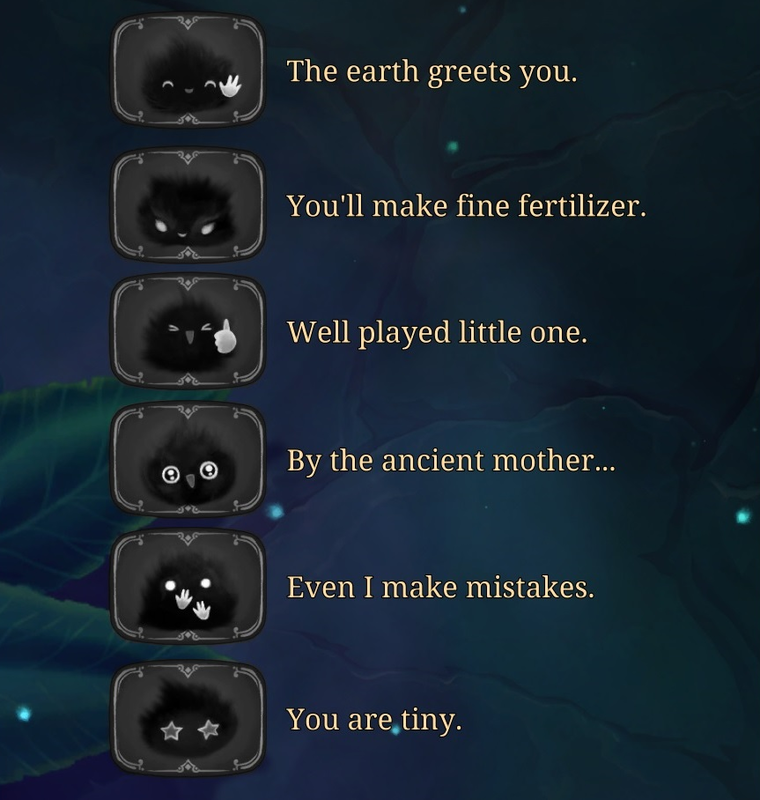 Taunt- "You'll make fine fertilizer." Well Played- "Well played little one." Wow- "By the ancient mother..."
Oops- "Even I make mistakes." Taunt- "I Will BURY You!" Well Played- "Well Played! You're Smarter Than You Smell." Unique- "There Can Be Only One!" Greetings- "So good to see you." 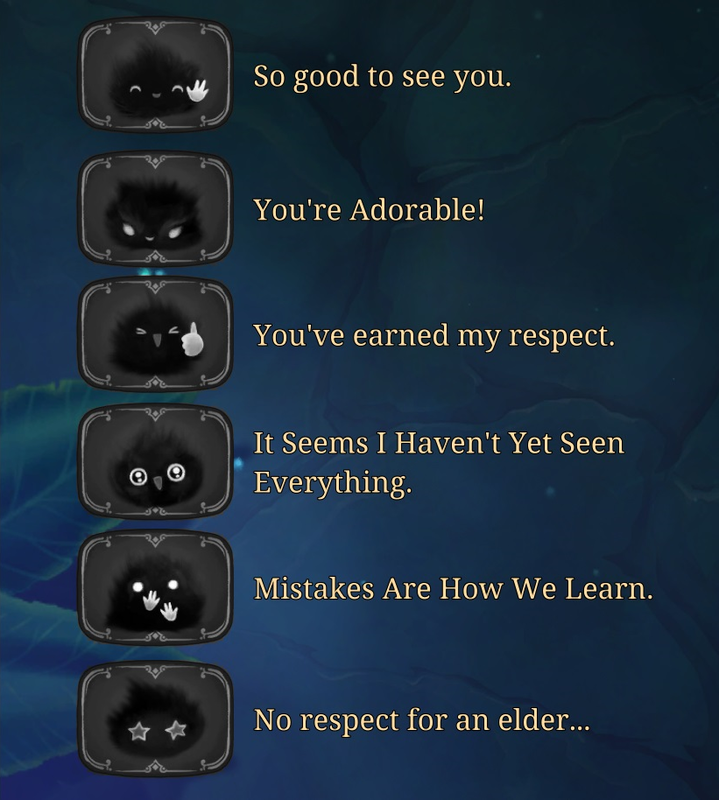 Well Played- "You've earned my respect." Wow- "It Seems I Haven't Yet Seen Everything." Oops- "Mistakes Are How We Learn." Unique- "No respect for an elder..."
Taunt- "I'll make a yak out of you!" Well Played- "You smart cookie!" 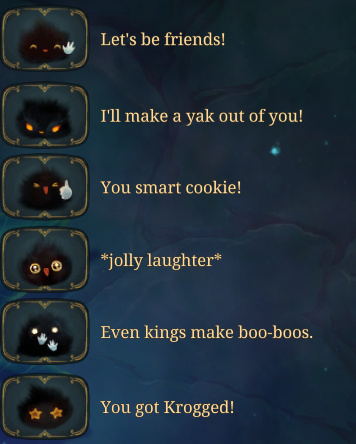 Oops- "Even kings make boo-boos." 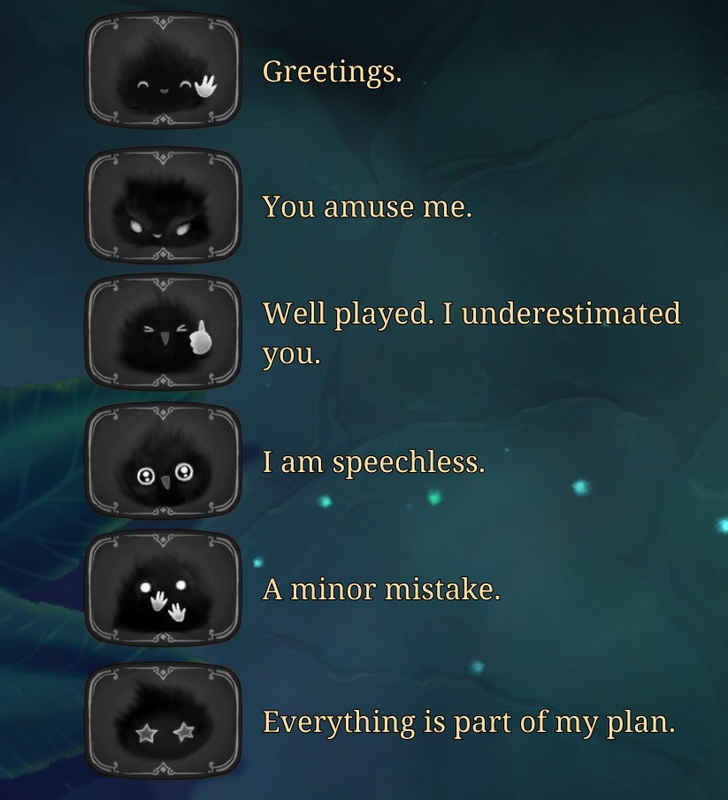 Taunt- "Your skills are not complete." Well Played- "Well played. Your skills are dangerous." Wow- "By the wild winds!" 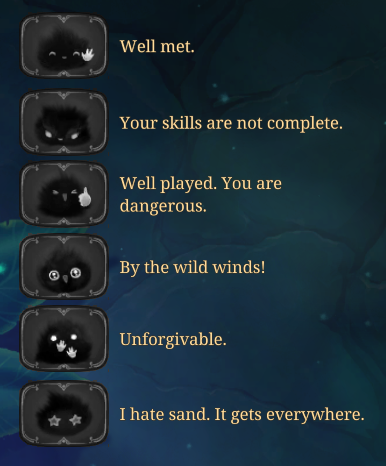 Unique- "I hate sand. It gets everywhere." Greetings- "Welcome to my realm." Well Played- "You exceeded my expectations." Unique- "Join me. It is your destiny." Taunt- "You've already lost. You just don't know it." Well Played- "You're a refreshing challenge!" Oops- "Shouldn't have done that." Unique- "I'm so smart, I astound myself!" Taunt- "Would you like your defeat gift-wrapped?" Well Played- "Well played. You're my favorite customer." Wow- "Incredible! I should have charged admission!" Oops- "Money can't buy wisdom." Unique- "Buy more chests, support your local merchant!" Well Played- "Well Played = True!" Wow- "Fun levels set to maximum!" Taunt- "You Will Not Survive." Oops- "That Was A Mistake." That's all of them so far! Which one was your favourite? Did you learn anything about the characters? Hey that last one is me! Are any of these translated / localized? If so, which ones & where? You need to update this and make the Bomb-R one also say 'unobtainable"